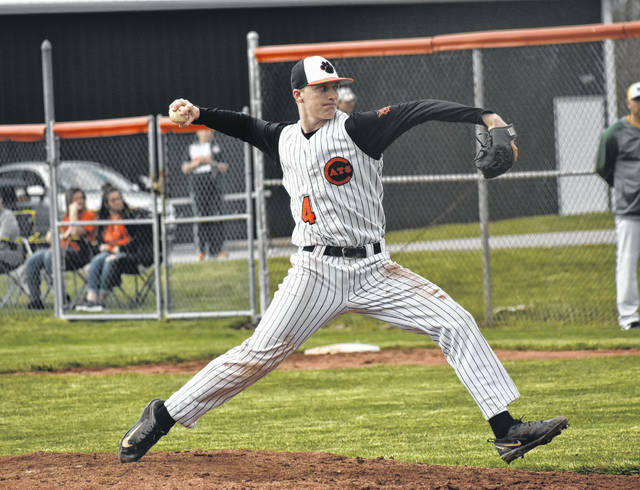 Whiteoak Senior Traeten Hamilton throws a pitch on Thursday against the North Adams Green Devils at Whiteoak High School where the teams squared off in a SHAC baseball showdown. Sophomore Alex Green throws a pitch against the Lady Green Devils of North Adams on Thursday at Whiteoak High School. MOWRYSTOWN — The Whiteoak Wildcats and Lady Wildcats hosted the North Adams Green Devils and Lady Green Devils on Thursday in Southern Hills Athletic Conference baseball and softball matchups; Whiteoak prevailed in both games as the baseball team won 4-2 and the softball team won 6-5 with each game going the distance. Traeten Hamilton got the start for the Wildcats and was dominant according to Whiteoak Head Coach Chris Veidt, but he was pulled after 86 pitches in favor of Ty Large who eventually gave way to Chase Butler. The Wildcats allowed two unearned runs in the top of the sixth inning when the Wildcats’ committed an error on a fly ball to right field that allowed two runs to cross the plate. Whiteoak jumped out to a 4-0 lead in the bottom of the first inning when Hamilton, Zach Harless, Mason Lehr and Evan Brill each crossed the plate for the Wildcats. Whiteoak was unable to score after the first inning and Veidt credited a pitching change to start the second inning for the Green Devils as the difference. 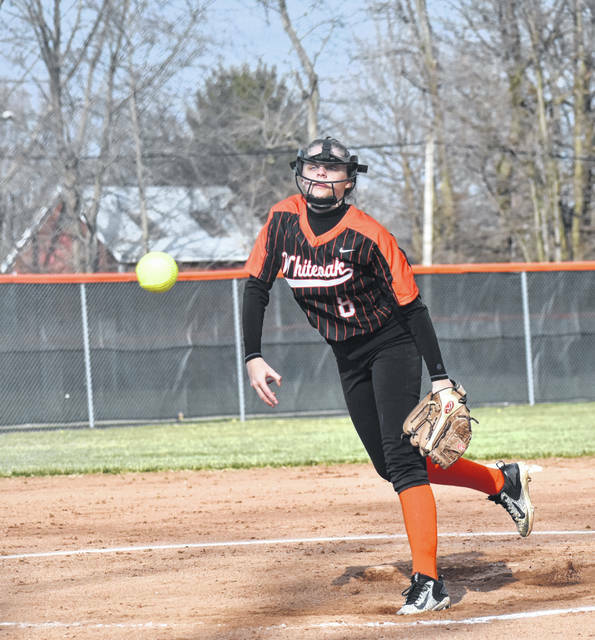 Alex Green got the start for the Lady Wildcats on the softball field and pitched a complete game and allowed three runs in the fourth inning, one in the sixth and an unearned run in the seventh inning. Brooklyn Gross and Cylee Bratton each scored in the first inning as the Lady Wildcats jumped out to a 2-0 lead in the bottom of the first inning. After the Lady Green Devils scored three runs in the top of the fourth inning to take a 3-2 lead the Lady Wildcats were able to keep them in check in the fifth inning and scored two runs of their own when Ann Ames and Emma Hawkins were able to take advantage of a throwing error by North Adams and cross the plate in the bottom of the fifth inning to give Whiteoak a 4-3 lead. The leadoff batter for the Lady Green Devils in the sixth inning reached base and later scored to knot the game at four runs apiece and the North Adams girls kept Whiteoak in check in the bottom of the sixth to keep the game tied as the teams prepared for the seventh inning of play. North Adams was able to score one run in the top of the seventh to set up a do or die situation for the Lady Wildcats in the bottom of the seventh inning. Ann Ames reached on an error by the Lady Green Devils and scored on a throwing error by the visitors during the at bat of Bratton who also reached base on an error and then scored the game winning run when Katie Ames hit a sacrifice fly to deep left field that allowed Bratton to tag up and score the game winning run.